In Boss Fight’s Mega Man 3, which we’ve run an excerpt from previously, creator Akira Kitamura talks (via Mike Drucker) about the character’s genesis, and “the sadness of being a robot”. The team used Cut Man as one of the monster-of-the-week villains and designed a protagonist inspired by a character from the Time Bokan anime, Tanpei—a genius boy sporting a blue jumpsuit and helmet equipped with cupcake-shaped cones. 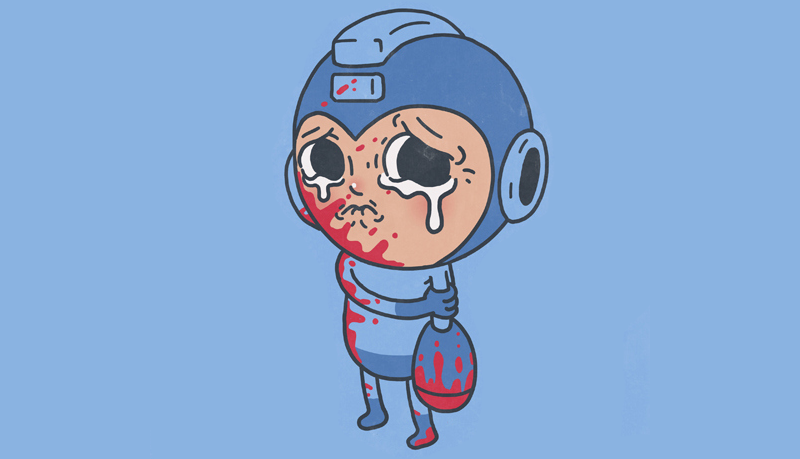 Despite the general silliness of this image, Kitamura sensed true sadness at Mega Man’s core. In the backstory I wrote, Mega Man alone is equipped with the functionality to turn himself off. That very fact imbues him with a sadness. The other robot masters were made for some kind of specific job or work, so there’s no need for them to have an “off switch” they can control. However, a robot helper like Mega Man can make his own judgements, and therefore can decide whether he’s needed or not...the sadness of being a robot is having this inorganic existence. You can grab a copy of the book here if you want to be even more bummed out.